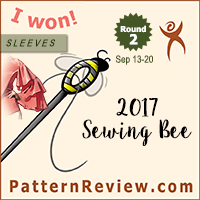 Continuing on with my Sew Geeky/Pattern Review Mini Wardrobe, I decided to make BurdaStyle 06-2014-103 as my second top for including in the contest entry. I like that it is a little more elevated than a boring black tee. I like long tops – but this one is super long! Close up of my trim, the sleeve, and the back of the top. Wardrobe Contest Notes: I made this as one of the three tops for my Wardrobe Contest Entry. I had decided last year that I would try to create seasonal wardrobe capsules as my sewing plans for the year, each one inspired by a Geeky fandom of mine. My spring inspiration is The Hunchback of Notre Dame, which was one of my favorite films and books growing up. I thought the lines of this top echoed some of the lines of the costuming, and I thought the use of the ribbon trim also played well with my intended motif. Pattern Description: Women’s knit top with cowl neck drape and trim. Pattern Sizing: Burda sizes 36-44. I made the 40 at the shoulders and graded out to a 42 at the hip. Were the instructions easy to follow? This was really a case of me reading the instructions, blatantly disregarding them, doing my own thing, and kind of having it work out. Basically, Burda repeatedly tells you in BOLD UNDERLINE that pattern pieces 24 and 25 (the trim pieces) are NOT pattern pieces, but simply guides for cutting and shaping bias trim. So, of course, I used them as pattern pieces and simply top-stitched my ribbon trim to them. It seems to have worked out fine. As far as the actual instructions go – the instructions for the bias trim are super confusing, but the rest of the instructions are really easy. So if you kind of go rogue like I did, and simply use the non-pattern pieces as pattern pieces, it is a pretty straightforward top to put together. Did it look like the photo/drawing on the envelope once you were done with it? I think it looks pretty close to the photo. The band detail isn’t quite as bold because I didn’t use a different fabric, but rather used a ribbon trim instead. What did you particularly like or dislike about this pattern? Likes: I like the style of this top, and I think my combination of the trim and main fabric makes this more interesting than just a basic t-shirt. Dislikes: Something about the proportion of the cowl drape feels slightly off. Also, the instructions for the bias contrast trim were super confusing, so I’m glad I decided to ignore them! Fabric used: Leftover black rayon jersey from Fabric.com that’s been in the stash for about a year. I bought the metallic trim from JoAnn fabrics specifically for this project. Pattern alterations or any design changes you made: I used the template pieces as pattern pieces even though Burda told me not to. Would you sew it again? Would you recommend it to others? 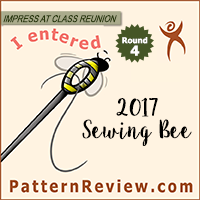 I might sew it again – it is a comfortable top and I like that I can mix a woven and knit together, which leads to lots of potentially interesting fabric combinations. I would recommend this pattern with the caveat that you should not let the instructions about the trim fluster you, and you can use the templates as pattern pieces without too much hassle. Conclusion: I’m very pleased with my new top. I think it fits in well with the wardrobe and it should be quite versatile. I also really enjoy the style of this top, and I think it will definitely get a lot of use as the weather gets warmer. That is gorgeous top! Much more interesting than a t-shirt. I gotta say, it looks tricky to put in that trim, but it look perfect. You should get a ton of wear out of it! This looks like a pattern you could remake to suit anything in your wardrobe. Burda’s instructions… lol… I just posted my skirt with safari pockets (terrible photos), and I had no idea what they were talking about. Wow I love this, its going in my to sew list ! Gorgeous top, I love the trim you picked.